Learn about the healthful living lifestyle using a high performance smoothie blender. We offer our points of view of how you might live healthier with blending up raw vegetable and fruit / food and to mix up your own healthy fresh raw vitamins in your smoothie concoction. One thing is sure, the more powerful the blender the more likely you get out more phyto nutrients from the vegetables and fruits that you blend. And the more phyto nutrients you get, the more immune system support your body will likely benefit from. Some may have diabetes, experience chronic pain of some kind, want to lose weight, increase energy, or even get rid of their depression. One way or the other you may be, as I used to be, hooked on some kind of a pharmaceutical drug, intended to make it all better. And here you are, finding yourself reading about blenders and raw food vegetable smoothies, with the hope to finally get your personal health issues under control. We sincerely wish you much success with that huge goal. I personally know what works for me. Reading through the articles and through the website will give you a better understanding of what I think might work. But, I caution. Find your own solutions. The contents discussed in these articles do not guarantee you that you will find the perfect method or remedy to your health concerns. Of course, your doctor or medical confidant may need to be brought into the equation of making health-full nutrition decisions. YOU are in charge of your own life and your own health. Not even your doctor can take that responsibility away from you, although that oftentimes, doctors do profess to know what's best for us. At least "THEY" are willing to take that risk for us, for example chemo therapy or radiation therapy...(L). YOU MUST DECIDE and try to find what works for you. The idea behind the published articles is introduce a healthful remedy together with the implementation of a 3 horsepower smoothie blender. such a high performance smoothie blender makes the key difference in providing a greater assortment of choice nutrients that will aid in quicker healing and increased lifestyle opportunities. A high performance blending machine cuts down ingredients to a cellular level that brings out far more phyto-nutrients than you wold ever know with any other kitchen blender that is not a professional heavy duty blender. The difference is in the horsepower. That is why we recommend a commercial grade blender, such as the OMNI Blender with a 3 horsepower motor and the capacity to use that heavy duty machine on a daily basis for many years to last. With blending, the reality wake-up call is that most people do not automatically have the skill and knowledge-set to manage and arrange a new blending and raw lifestyle affair over night. Making raw smoothies is not as easy as you can turn on your blender. There are many more issues that can put a huge stumbling block into your lifestyle adjustment. If you think the OMNI V 3 hp Smoothie Power Machine at $240 with free shipping is expensive, try again. 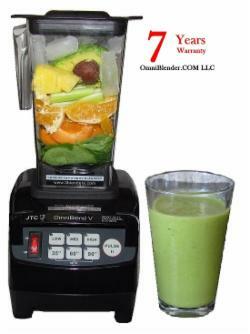 The OMNI blender is as good a the higher priced blenders, and they start at $ 500 upwards. We need to take into the equation also the fact that all those yummy smoothies, ice creams, sauces, and soups that you may have savored over at Costco or wherever you may have seen such blender presentation, the presenters are hired professional smoothie blender chefs! They often have years of experience to make smoothies. And they have all the food available at that demo stand. And they only make planned recipe smoothies, soups and ice creams. They follow a script too. And on top, many blenders come with gimmicks such as HEATING or Hot Soup Buttons and Dry and Wet Blade, or even BPA-FREE jar... all serving one matter; "MARKETING and SALES". A blender is not a heating or cooking device. The blade turns very fast so friction inside the blade with its bushing or ball bearing turns the blade assembly into a heating element. UL (Underwriter Laboratories) does not even approve of such heating features. Of course, you can do blend and make great smoothies too. Select your blender and make your first smoothie. Try to copy the soup or ice cream you just had seen so easily and quickly made. Most people, as the statistics have shown, experience an embarrassing disappointment. It's embarrassing because you just spent $ 500 or so bucks on a blender. At least spend only $269 - free shipping - and you get the same quality anyway. And so you tell yourself "Ok, I will try it again tomorrow". And tomorrow comes and 6 months later the blender is either returned, off the counter top or in the garage...back in the box. That is why, as a blender dealer, I have frequently been blessed with buying old but brand-new never used and still in the box high performance blenders for a bargain. What a shame... So, please, do yourself a favor, read on. USE THE HECK OUT OF YOUR BLENDER! Explore what it might take for one or the other to really become a smoothie raw food healthy soup etc. expert. Because if you are not planning on becoming a raw food enthusiast, why do you want to buy a 3 hp high performance blender? A KitchenAid blender or Cusinart might just be sufficient for your occasional usage. As an intro to Blending 101-Lifestyle Choice, please note, unless you have tons of capital, you cannot just change your modern kitchen into a raw kitchen over night. Victoria Boutenko did a radical and possible thing. She ripped out the microwave and covered up the stop top and from one day to the next she jumped into the boat of RAW DELICIOUS GREEN SMOOTHIES. Anybody can do this. If there is a will there is a way. So most of all, this lifestyle change will begin with the purchase of your blender. But a healthy raw food lifestyle change requires more than just a blender. If you put into your mind right now "TO MAKE IT ALL AS EASY AS POSSIBLE" it will help your chances to switch over easier. A simple - to use Blender is the best start. I recommend the OMNI V 3 Hp Blender. Everything needs to be made simple. Leonardo DaVinci said that "simplicity is the ultimate sophistication". Why the heck do you need a blender-television-radio-cell-phone-computer-station-heater-toaster-wheat-grinder-dehydrator-and-water-purifier, all-in-one? According to our dear and famous competitors, their blenders can replace 20-something or even more of other small appliances...what a crock. Don't believe it. A Blender is best for blending smoothies and sauces, nothing else! So, please do not throw away your toaster oven, your food processor and mixer, etc... You will find out "WHY" later! And if you want to hear my opinion, I personally also believe that you should cook your hot soups in your cooking pot. Maybe at the end you can put into that delicious soup of yours some blended-up pureed fresh vegetables. But for the sake of argument, yes, all the 3 hp blenders available, including the <2 hp Montel Healthmaster Blender, can make hot soup by blending between 4 to 7 minutes. Many blenders do not hold up well. The OMNI Blender (aka OMNIBLEND V / or TM-800A) is the perfect high power smoothie emulsifier, equipped with a 3 hp blender motor and over 35,000 RMP's. The Nija, Cusineart, KitchenAid - type household kitchen blenders are maybe capable of blending a serious smoothie a few times, before they quickly wear out and break. The Health Master Blender is a sad example of a poorly manufactured wannabe high performance blender. And the Ninja is so poorly designed that you could way too easily cut yourself during cleaning and/or blending. Beware!